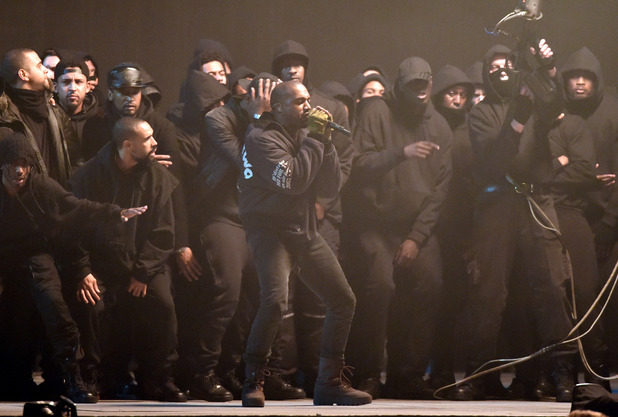 Leave it to Kanye West to turn a performance at the 2015 BRIT Awards into an official music video and pull it off effortlessly. After teasing a Steve McQueen-directed video for his song “All Day” during Paris Fashion Week, West has altered his creative direction for the new track. The rapper stated on Twitter: “I felt the Brits performance captured the energy of the record.” The video features West and song collaborators Theophilus London and Allan Kingdom standing front and center surrounded by a large mob of U.K grime artists and rappers including SKEPTA and STORMZY. The simplistic stage setup also features two flamethrowers. The best part about the live performance music video is watching the crowd reactions. Throughout the video, the shot cuts to West’s wife, Kim Kardashian, standing next to world famous designer, Ralph Lauren, a dancing Taylor Swift and a flabbergasted Lionel Richie. Watch the video for “All Day” below.